Found today tough, didn't get the best sleep as it was so cold and took me ages to warm up. Had to get P to cuddle up close to get some warmth into me. I just don't know how he does it? I'd socks on and I put on my track pants, but to no avail. Once I was warm I did at least sleep a bit. The night's temperature was obviously at the outside limits of our sleeping bags. I slept OK, but Sandi had her issues: not sure what it got down to, but we were to learn in Balingup later that tomorrow night got down to 2°C. Balingup is ~150m lower than Noggerup, and different night, so who knows? But we decided that if the temperature was going to be an issue some thermals or skins would be a good idea. Hands painfully cold taking down the tent this morning. Even Les, who never gets cold, had shaking hands and a dripping nose (she sleeps warm in a +10 bag). After the many highlights of yesterday, we were given a calming walk through the forests today. The old railway formations were particularly nice to walk on. Morning very cold and stressful because of it. Hands simply not working well, and not really thinking efficiently. However we got packed up and away not long after Amanda and Lesley, the two older women who were there overnight. It hadn't rained overnight and clear skies greeted us then the usual cloud progressively gathering. We set off along the railway formation and I must ray that I very much enjoyed the 3 of these in today's walk, particularly the longer two. Embankments, cuttings, a siding and even a "log loader". We thought it might be something to do with loading logs on the rail? Saw some great orchids, some indicated by Headley we presume, who is walking ahead of us by a few days and often makes 'orchid' comments. He leaves an arrow drawn on the track if he finds one that's more unusual. The undulations in the elevation profile generally indicate creeks: today they seem to be the link between more level rail formations or old vehicle tracks. The Guidebook notes that after Bennett Road the Track crosses another creek with extensive rush and reed growth. We were not too keen on the Soap Bush, but marched on along Atom Road, which is very picturesque through this forest, to our morning tea stop and later the log landing; after which the Track descends to yet 'another creek'. We were quite disappointed about the missing Reference Tree and virgin Jarrah, but as the kilometres ticked by it became obvious that we weren't going to find it; so we headed up to Lowden-Grimwade Road and our lunch stop. Lunch wasn't a great stop today as it was cloudy and cold, Sandi wasn't feeling her best either. 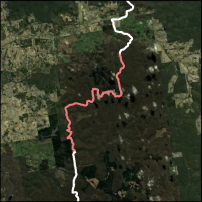 After lunch the Track runs down to 'another creek' on an old railway formation, then up and over a couple more hills and creek valleys to Grimwade campsite. The legs and feet did feel weary though. Saw a huge kanagroo bound into the bush (early in the day). We even had a pack off afternoon tea before the last climb -- which we zipped up quickly after the 10 minute break. The tree hovea was stunning and some new orchids today too. Morning tea and lunch failed to revive me as much as what they usually do, so I had to employ sweets for a bit of a boost, and we certainly did well enough, but I did feel quite under par and then very glad to get here and then very glad of a lie down and snooze. While Sandi was sleeping I put up the tent and explored the area around the campsite: which is pretty stunning! Sandi not feeling the best and after a cup of tea is having a lie down (we didn't have any Bex) -- I'm watching the sun go down in the Jarrah. Saw a big red kangaroo and a wallaby today. Some red capped green backed parrots. Lovely bird calls all day. P whistling back to them as we walked through the forests. Balingup tomorrow. Got some dinner together (love our lucky-dip technique), got ready for tomorrow and headed up the hill to our tent. Feeling a bit better now and very relieved that the night doesn't seem as cold as last night. Sun lasted a bit better at this hut too, made it seem earlier. The SONY made neat sweeping panoramas, which here detail the changing environment over the 1,000km. We were amazed at the lack of fauna we found, but what we did find is here. For 54 days in September and October we walked the 1,021 km from Perth to Albany taking 9,106 photographs and 1,215,573 footsteps over 316 hours of walking.